World premiere recordings of marvellous chamber music by one of Australia's neglected composers. Margaret Sutherland (1897-1984) studied with Arnold Bax in the 1920s and returned to Australia to write some of this country's most original and striking works and to promote Australian music especially in education. This CD fills a resounding gap in the recorded repertoire of the heritage of Australian composition. Sutherland contributed in sparse numbers but in richness of individuality to the output of twentieth century Australian composers. In her economically expressed music she is by no means the Bax disciple her tutelage with that composer might lead you to expect. In David Symons' extensive notes (expansive supporting text being a delightful feature of Tall Poppies CDs) her role is contrasted with that of her countrywoman Peggy Glanville-Hicks. Sutherland accommodated her creativity within the orthodoxy of wife and mother while Glanville-Hicks travelled widely rejecting any bearing her gender might have had on her music. The sonata, though admired by Bax, is no Baxian epic. Rather it is rhapsodic in a fairly 'advanced' idiom. Sutherland drops her guard at times including at 5.38 in the middle movement. Otherwise think in terms of Bloch and Szymanowski given a bitter harmonic twist. The caprice of the work also lifts us towards Cyril Scott and Sorabji. The Nocturne joins the worlds of the sentimental song and of central European folksong. This might easily have been a chip from Szymanowski's Mythes though more straightforward harmonically speaking. A charmer. The remaining tracks abandon the piano. Without undue dryness the content dips towards the didactic. The emotional core is staid though excitement colours the gay finale of Contrasts, a work in which playing of technical mastery incorporates a real sense of dynamic gradation. Swapping one of the pair of violins for a viola we come to the similar Bagatelles. Here, however, a more emotional element is allowed to surface. The elegance and folk feel of the music suggests a Hungarian connection. The Divertimento continues on similar tracks. Its rewards are there but are in economy of expression rather than luxury. A shame that the words of The World and the Child (by Judith Wright) are not included. These take as their theme the wonder of a child's intuitive learning and the loss of innocence implicit in the process of learning. Stylistically Sutherland veers into Britten territory although she allows herself slightly more emotional pith. I was also reminded of Arnold Cooke and of William Alwyn in his more austere moments. Masterfully, Sutherland breathes softly over the words 'nets have been breached and men have died in vain'. Magically done. I now want to hear her other songs including The Orange Tree and The gentle water bird. The dignified enriching beauty of Sutherland's music is undeniable. 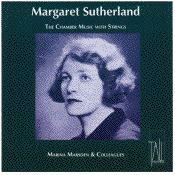 Sutherland's music is characterised by lyric intensity and a restraint both in form and content which belies deep and often poignant expression… However, she preferred the medium of more intimate dialogue.… Marina Marsden and Robert Chamberlain bring great understanding and empathy to the Violin Sonata with attention to detail and a warm rounded violin sound, which is always sensitive to the many moods…Margaret Sutherland is well served by performers who show a great affinity with her music and at the same time pay stylishly and expressively. This recording handsomely redresses the virtual neglect of this enormously gifted composer.